With this utility you can insert a formula in "international" notation into the selected cells. An "international" formula is a formula that uses English worksheet formula names, a comma as list separator and a point as decimal separator. This utility can be very useful if you do not use an English version of Excel or if you use different country settings. On the Internet you can find an enormous quantity of example formulas for Excel. Most examples on the Internet and in Excel books use the "international" formula notation. With this utility you can now easily use such formulas, independent from your Excel version or country settings. 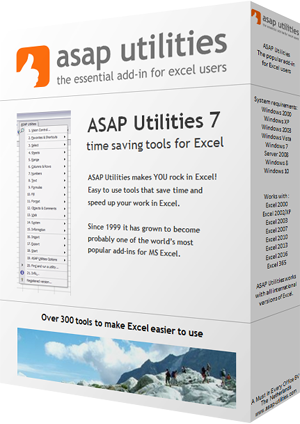 ASAP Utilities converts them automatically to be used in your Excel version. For example if you use the Dutch version of Excel with the Dutch country settings in Windows, then this utility translates the "international" formula "=SUMIF(A2:A13,">50")*1.19" automatically to "=SOM.ALS(A2:A13;">50")*1,19" when you insert the formula. You can use this utility for both regular- and array formulas.